Despite one in four children in Australia entering preschool using English as an additional language or dialect (EAL/D) (Australian Bureau of Statistics (ABS) in Migration 2015–16. Retrieved from http://www.abs.gov.au/ausstats/abs@.nsf/Latestproducts/3412.0MediaRelease12015-16, 2017), Australian classrooms are predominantly monolingual English-speaking. This mismatch in languages may affect how participation and relationships are established. 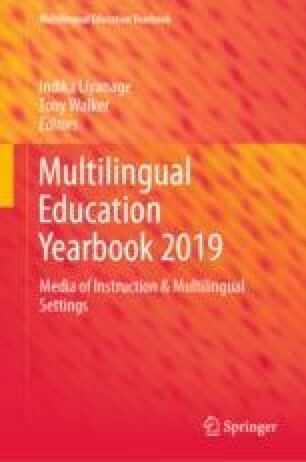 This chapter explores children’s strategies for making friends in settings characterised by linguistic diversity but where the medium of instruction is English. Child-friendly video-recorded interviews with 72 preschool-aged children, 3–4 years, were conducted in a preschool at an inner-city centre. Children were asked to talk and draw a picture about making friends when there are language differences. Children’s responses not only revealed their competencies in using non-verbal strategies to communicate with each other but also reflected inclusive attitudes. The importance of using a variety of languages as media of instruction, such as including songs and words representative of the minority languages of the classroom, and having positive conversations with children about language difference are highlighted. Australian Bureau of Statistics (ABS). (2017). Migration 2015–16. Retrieved from http://www.abs.gov.au/ausstats/abs@.nsf/Latestproducts/3412.0MediaRelease12015-16. Halle, T., Hair, E., Wandner, L., McNamara, M., & Chien, N. (2012). Predictors and outcomes of early vs. later English language proficiency among English language learners. Early Childhood Research Quarterly, 27(1), 1–20. https://doi.org/10.1016/j.ecresq.2011.07.00. Hartup, W. W. (1992). Having friends, making friends and keeping friends: Relationships as educational contexts. ERIC Digest. Retrieved from http://ericeece.org/pubs/digests/1992/hartup92.html.